If you will indulge me, momentarily, in a cliché, we can imagine that history is an onflowing river. To those who live along its banks in the state of nature, it is a source of nourishment and the only means of hygiene. But to that riperian people which wishes to raise itself to the grandeur of civilization, it is also a perplexing and troublesome source of instability, eroding constantly the very ground beneath their feet. A norm serves as a dam, thrown up at some arbitrary point along the length of the river, to provide stability. Everything new that streams in piles up behind it, being forced to mix itself in with what came before, and producing the placidity of a lake. This is the stability on which great cultures can be raised, not unlike the crannogs of bronze age Ireland and Scotland, which provided both defence and access to a richly varied food supply to their inhabitants. Crannogs, of course, are beautifully suited to lakes, but cannot be erected in rivers. Eventually the pressure becomes too great, and the dam is burst; it becomes necessary to start the process over again, a little farther down the river. But how does it come about that the dam bursts? What means does the norm employ in its efforts to preserve itself, and how is it that the exception eventually defeats these efforts? While the interest of most people is, understandably, directed toward this process writ large--in religious conversions, political revolutions, or the enfranchisement of marginalized peoples--the sheer number of variables involved in any great societal upheaval frequently obscures the simple mechanisms of the struggle between norm and exception. I would therefore have us examine the issue through the microcosm of a single movement in the nineteenth century British art world: Pre-Raphaelitism. In 1768, the year before he was to become Sir Joshua, Joshua Reynolds founded the Royal Academy of Arts by permission of King George III. Its combined mission of education in the arts and exhibition of new works, in the hopes of inculcating a cultivated national style, set it apart from prior art societies in Great Britain, which had been primarily exhibiting clubs. Through its most important activites--the extensive art school which it administered and the Summer Exhibition--it quickly came to dominate Britain's art scene as an arbiter of taste and style. In the first half of the nineteenth century, its arbitration was governed by a series of lectures which had been delivered by its founder and first president between 1769 and 1790, collectively known as the Discourses on Art. It will be worth taking some time to analyze Reynolds' opinions, as they not only formed the norm of British art during the period which we will shortly consider, but also because they contain some interesting opinions on the value of exceptionality. What ultimately came to be of foremost importance to the Academy was the theme of Sir Joshua's first discourse, which emphasized to students the necessity of obedience to past example. He wrote, "I would chiefly recommend that an implicit obedience to the rules of art, as established by the great masters, should be exacted from the young students. That those models, which have passed through the approbation of ages, should be considered by them as perfect and infallible guides as subjects for their imitation, not their criticism." 1 Reynolds has often been unfairly maligned for advocating an utter thralldom to past masters; in fact, these cautionary words were only meant to apply to beginning and intermediate students. Reynolds went on in subsequent discourses to elaborate a much more charitable view of innovation on the part of more advanced students, when they had attained to a mastery of the discipline. Such a student could "regard himself as holding the same rank with those masters whom he before obeyed as teachers". 2 Unfortunately, Reynolds' successors in the Academy were wont to lose sight of this caveat, as teachers are all too often loathe to confess that their students have become their equals. Reynolds' advice to students became the norm of artistic practice at all levels, and established a painterly pantheon to whose example all British art was held captive. The debt to Platonism is obvious. Reynolds had made Beauty synonymous with the Good. It was a transcendent ideal (although its signs were to be sought upon the Earth) as perfect and immutable as any deity, and nature was, wherever it strayed from the norm of Beauty, to be corrected along Raphaelite lines. The business of the painter was to deal in forms, in order that he "like the philosopher, will consider nature in the abstract, and represent in every one of his figures the character of its species." 9 Reynolds' doctrine was a total and uncompromising victory of norm over exception. But Reynolds' norm was not the transcendent thing it made itself out to be. Like all norms, it was an arbitrary point along the river of history, which he had dammed. The establishment of any norm, being temporally defined, of necessity renders all other periods exceptional to the new order. In doing so, it nourishes its own internal discontent. The inertia of norms is exceptionally powerful once they have become widely accepted; the average man is as Sir Joshua asked his intermediate students to be, "afraid of trusting his own judgment, and of deviating into any track where he cannot find the footsteps of some former master." 10 This makes it nearly impossible to advance the cause of an exception as such. Exceptions therefore seek to claim the legitimacy of the bloodline of some past norm, in order to lend themselves, as pretenders, an equal dignity with the reigning king. By exceptionalizing the past (and all of its norms by necessity), a space is created in which it possible to be an exception with all of the credibility of a norm. It should come as no surprise then that the ultimately fatal challenge to Reynolds' system came from a group of young painters and critics calling themselves the Pre-Raphaelite Brotherhood. In 1848 John Everett Millais and William Holman Hunt were students at the Royal Academy school, and Dante Gabriel Rossetti had been until recently. All were in some measure disenchanted with the prevailing style, but lacked any crystalizing principle with which to voice their discontent. This was provided in August of that year, when Rossetti and Hunt chanced upon a collection of engravings of the frescoes of the Campo Santo in Pisa. Although Rossetti was slow to come around to their virtues, Hunt was taken with the fourteenth and early fifteenth century paintings immediately. What he found in them was a sincerity as yet untrammeled by the conventions which emerged in the wake of Raphael. What is more, he felt "that the Campo Santo designs were remarkable for incident derived from attentive observation of inexhaustible nature." 11 Hunt convinced Rossetti and Millais that these engravings carried the seeds of a regeneration. Rossetti formalized their mutual commitment not to imitate, but to draw inspiration from these early Italian painters by the establishment of the Pre-Raphaelite Brotherhood, the existence of which was initially kept secret, with its members simply painting the enigmatic acronym "P.R.B." beneath their signatures. The norms once set by Giotto, Spinello Aretino, Simone Memmi, Veneziano, Pietro Laurati, Buffalmacco, and Andrea Orcagna, which were transformed into exceptions by the later ascendency of Raphael, could not be reestablished; neither did anyone wish to do so. The flaws of perspective and the treatment of light and shade were obvious even to Hunt. They would, however, be seized upon to legitimize a new exception in Victorian painting. That exception was based on accepting what Reynolds could not--the primacy of uncensored nature. Beside the engravings of the Campo Santo, Hunt's other major influence had been a series of books recently begun by the art critic John Ruskin, entitled Modern Painters. In his first volume, published in 1843, Ruskin had urged artists to "go to nature in all singleness of heart, and walk with her laboriously and trustingly, having no other thoughts but how best to penetrate her meaning, and remember her instruction; rejecting nothing and selecting nothing, and scorning nothing; believing all things are right and good, and rejoicing always in the truth." 12 It is difficult to imagine advice farther removed from that given by Sir Joshua Reynolds. It was this dedication to nature which Hunt saw in the florid diversity of figures and meticulous attention to detail of Raphael's predecessors, and it was this which the Brotherhood sought to capture, not in specifics, but in spirit. Hunt and his comrades were building upon Ruskin to answer the challenge implicit in Reynolds' thought--a contest to decide whether the works of man or of nature were the norm. Hunt and Millais both submitted paintings ( Rienzi and Lorenzo and Isabella, respectively) to the Royal Academy's Summer Exhibition in 1849. Both were accepted and hung, and received minor but pleasant acknowledgements in a few publications' reviews of the event. Rossetti, who had originally intended to join them there, decided at the last minute to send his work (The Girlhood of Mary Virgin) to the rival Free Exhibition, where it too was moderately well-received. No reviewer took notice of the initials "P.R.B." signed beneath their names. What is to account for the vehemence of the calumnies of 1850, after the pleasant, if meagre, reception afforded all three painters in 1849? Only that their association was unknown the previous year. The reviewer Frank Stone described them as "a school of artists whose younger members unconsciously write its condemnation in the very title which they adopt", 17 a charge which obviously could not have been levied when the title was unknown. The very notion of a 'Pre-Raphaelitism' was a declaration of war on Reynolds' Discourses on Art. The nature of the criticisms is telling. None of the pictures lacked perspective, or fine control of light and shadow (though they did not obey the Raphaelite rule of using specific ratios). Even the most cursory glance at any of the paintings would acquit them of the charge of being mere imitations of early Renaissance art, or of meticulously copying obvious technical flaws in the works of that period. Such straw man arguments are the natural rejoinder of the norm to the exception in the modern period. We have seen how newly arisen exceptions turn to past norms (themselves exceptionalized by the present norm) to lend themselves an air of legitimacy capable of overcoming the inertia of complacent societies. In so doing, however, they wander into a trap. The modern age is characterized by a mythology of progress, which is applied to every aspect of human life. This worldview makes it difficult to attack an exception as long as it openly proclaims itself to be so. The same public which is wary of embracing an exception is too apt to see it as a manifestation or a symbol of progress. While it might not achieve the critical mass of support necessary to overthrow the norm, the exception can, in this way, gain enough support to ensconce itself as a permanent subcultural feature of the society. When it consents to place itself under the legitimizing auspices of a past norm, however, it risks sacrificing this association with progress. The present norm is then able to hold itself up as the crowning achievement of onrushing history, and to decry the exception as an anachronism. This almost invariably demands a perverse fictionalization of the exception's true nature, as few movements seek a fully necromantic consultation with past epochs, but such a distortion is not difficult to create or to publicize. It was this process to which the Pre-Raphaelite Brethren fell victim in the summer of 1850. Millais and Hunt returned to the Summer Exhibition the following year, Millais with Mariana, The Woodman's Daughter, and The Return of the Dove to the Ark, and Hunt with Valentine Rescing Sylvia from Proteus. Once again nearly every important paper in the country peppered them, as well as the other Brethren exhibiting, with abuse. Worst of all was the censure of The Times, which wrote a lengthy and scathing review, proclaiming that "With the utmost readiness to humour even the caprices of Art when they bear the stamp of originality and genius, we can extend no toleration to a mere servile imitation of the cramped style, false perspective, and crude coulour of remote antiquity." With the country's most prestigious publication deriding their work as "a morbid infatuation which sacrifices truth, beauty, and genuine feeling to mere eccentricity", only one serious option remained to them if they were to have any hope of enjoying artistic careers beyond the end of the season. They needed an ally. Millais went to visit an associate of his, the poet Coventry Patmore who, while not a Pre-Raphaelite brother, was a great admirer of their work. Patmore was also a personal friend of that same John Ruskin, whose first volume of Modern Painters had so impressed Hunt. Ruskin had, since the release of that work in 1843, published three more books: Modern Painters, Volume II (1846), The Seven Lamps of Architecture (1849), and The Stones of Venice, Volume I (1851). Each had been tremendously successful, and he was now one the foremost authorities on art in the British Empire. Interestingly, this status had been obtained while advancing views that were, in many ways, incongruous with the views of Reynolds, who continued even in death to be the undisputed ruler of Britain's foremost art institution. Ruskin had managed this by what Wendell Harris calls a "strategic efficacy" that "allowed for the modification rather than the denial of a number of Reynolds's key doctrines". 18 Reynolds had preached a kind of Platonism, in which the artist strove to liberate himself from all particularities, in order to commune with the Good through Beauty in its abstract. Ruskin, building on his own evangelical background, grounded Reynolds' desire to approach the Good through Beauty in a Christian appeal to mindfulness and gratitude to God, called forth by the appreciation of the beauty of God's creation. In doing so, Ruskin inverted Reynolds' exaltation of the general, proclaiming instead the superiority of faithfulness to nature through particularity and detail as an expression of God's truth. Yet at the same time, Ruskin managed not to break from Reynolds completely, as his aesthetic theory concurred with the Discourses in its basic understanding of the moral value of art (though this was only faintly sketched in the Discourses ), and its insistence on cognitive content over mere technique. Ruskin could therefore, in utter sincerity, quietly challenge Reynolds on some central points, while loftily praising him on the whole, listing him among the five great painters of the English school. 19 While many conservative reviewers of Modern Painters were quick to note the mismatch between Ruskin's claims and Reynolds' doctrines in questions of the general vs. the specific, it was difficult to wholly castigate him, as he did not set himself up as a rebel. Harris writes "Ruskin was not so much challenging the Royal Academy's principles as bending them to his own uses." 20 In this way, he managed to build himself a position based on ideas which made the value of art accessible, and standards for art intelligible, to Britain's educated Christian population, while being harmonizable enough with the reigning aesthetics to appeal to some, though certainly not to all, of Britain's artistic elite. Ruskin carefully cultivated a niche as the extreme end of the norm, without crossing over into the exception. Ruskin followed this with a second letter to The Times, which closed with the predication that "they [the Pre-Raphaelites] may, as they gain experience, lay in our England the foundation of a school of art nobler than the world has seen for three hundred years." 23 The value of Ruskin's contribution to the debate came not least from the fact that Ruskin could truly claim that he had "no acquaintance with any of these artists, and very imperfect sympathy with them." 24 He was able to hold himself aloof in the limbo between norm and exception that he had so carefully created, even as he took advantage of the way in which the Pre-Raphaelite Brethren had declared his own doctrines as the truly revolutionary manifesto that they were. Ruskin's position would not allow him to challenge the Academy overtly, without being subjected to the same excoriation that Rossetti, Hunt, Millais, and their associates received, but it made him the perfect mediator. He was uniquely positioned, as one bordering on exceptionality without quite crossing over, to denounce the norm's sham defence from the inside. He successfully dismantled the fiction of Pre-Raphaelite atavism, and paved the way for progressive critics and the general public to embrace Pre-Raphaelite artists on their own terms. The effect of Ruskin's support, though not immediate, was dramatic. Over the ensuing few months many formerly timid critics were induced to come out in support of the Brotherhood, and many old opponents at least confined their criticisms to a more reasonable, and truthful, scale. The rest of the story is long from the perspective of the art historian, but quite succinct for our present purposes. The entrance of all of the Pre-Raphaelites, and most especially Hunt and Millais, in the exhibition of 1852 was a smashing success in the English press. 1853 even more so, with one of Millais' paintings, The Order of Release, compelling the Academy to introduce a uniformed guard for the purpose of moving crowds along for the first time in the Exhibition's history. By the end of that year, Millais was voted an Associate of the Royal Academy. He would go on to be its president. We have seen in this story the purposes which norms serve, and the means by which they, in exceptionalizing past norms, provide an avenue by which present exceptions can legitimize themselves. We have seen, too, the ways in which exceptions are, in taking advantage of this, made vulnerable to accusations of backwardness and unoriginality. Yet our most fundamental question remains only partly answered. Why do exceptions, ultimately, overcome norms? How is it that a handful of young art students assailed over a half-century of entrenched standards of artistic excellence and won? How is it that, in only five years, their ridiculed exception overthrew the venerated academic norm in both public taste and much literate criticism, and catapulted one among their number to membership in, and four decades later the presidency of, the very institution which had established and maintained that norm? This is certainly, in part, to be ascribed to Ruskin's mediation, but Ruskin's mediation only worked in tandem with a more universal principle. The river of history, on whose shores we began our investigation, is relentless. We need not be believers in the cult of progress, ascribing teleogical value to the flow, to recognize that the meandering current is always in motion. The very dams which serve, indispensibly, to establish norms are exceptions to the river. In the end, exceptions invariably overturn norms precisely because the dynamic cosmos will permit no exceptions. Cook, E.T. and Wedderburn, Alexander (eds.). The Works of John Ruskin. London: George Allen. 1903-12. Fleming, G.H. Rossetti and the Pre-Raphaelite Brotherhood. London: Rupert Hart-Davis Ltd. 1967. Gaunt, William. The Pre-Raphaelite Tragedy. London: Jonathan Cape, Ltd. 1942. Gombrich, E.H. The Preference for the Primitive: Episodes in the History of Western Taste and Art . London: Phaidon Press Limited. 2002. Harris, Wendell V. "Ruskin's Theoretic Practicality and the Royal Academy's Aesthetic Idealism". In Nineteeth-Century Literature, Vol. 52, No. 1 (June 1997): 80-102. Hunt, John Dixon. The Pre-Raphaelite Imagination 1848-1900. Lincoln: University of Nebraska Press. 1968. Ruskin, John. Modern Painters: Volume I. London: Smith, Elder and Co. 1843. Stanford, Derek (ed.). Pre-Raphaelite Writing: An Anthology . London: J.M. Dent & Sons, Ltd. 1973. Wellend, D.S.R. The Pre-Raphaelites in Literature and Art. Freeport, New York: Books for Libraries Press. 1969. 1 Edward Gilpin Johnson (ed. ), Sir Joshua Reynolds's Discourses, (Chicago: A.C. McClurg and Company, 1891), 57. 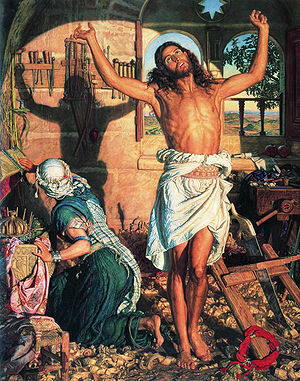 11 William Holman Hunt, quoted in G.H. Fleming, Rossetti and the Pre-Raphaelite Brotherhood, (London: Rupert Hart-Davis Ltd., 1967), 64. 12 John Ruskin, Modern Painters: Volume I, (London: Smith, Elder and Co., 1843), 417. 13 Frank Stone, quoted in Fleming, 133. 14 Angus Reach, quoted in Fleming, 135. 15 Quoted in Fleming, 136. 17 Frank Stone, quoted in Fleming, 138. 18 Wendell V. Harris, "Ruskin's Theoretic Practicality and the Royal Academy's Aesthetic Idealism" in Nineteeth-Century Literature, Vol. 52, No. 1 (June 1997), pp. 80-102. 19 E.T. Cook and Alexander Wedderburn (eds. ), The Works of John Ruskin, (London: George Allen, 1903-12), 16.197 and 33.311. 21 Sadly, no record of their conversation survives. 22 John Ruskin, quoted in Fleming, 162-3. Race Capet is poet and essayist from the West Coast whose nonfiction work has appeared in a number of journals, including "CrossCurrents", "Word in the World", and "Burning Houses".